America’s broadcast voice in Russia will soon be silenced following Moscow's ratification of a new law that will force a legendary broadcasting company to abandon the Russian airwaves. 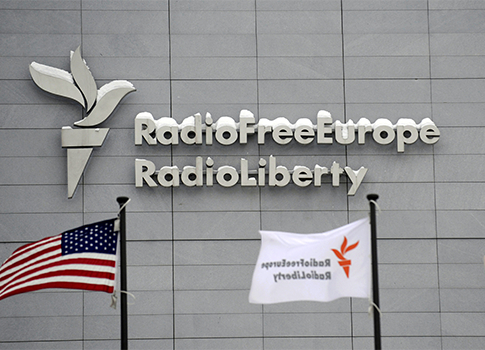 Radio Liberty (RL), a division of the U.S.-funded Radio Free Europe (RFE), recently fired a large portion of its staff after the passage of a Russian law prohibiting foreign-owned media outlets from broadcasting on AM frequencies. The unexpected mass layoffs came as a shock to RL journalists and Russian human rights activists alike, and spurred accusations that the Obama administration is kowtowing to Russian President Vladimir Putin as he seeks to silence the democratic voice that helped topple communism. "The timing of it, the way it was done, and the lack of explanation" sends an unfortunate message, said David Kramer, president of the human rights organization Freedom House. "It creates the impression, whether intended or not, that the U.S. is pulling out [of Russia], and that’s not the impression we want to leave." On Nov. 10, RL, known by locals as Radio Svoboda, will cease its AM broadcasts after nearly 60 years on the airwaves. During that time, RFE-RL fought communism from behind the Iron Curtain, where its pro-America broadcasts provided an alternate source of news for Russians interested in a Western perspective. The station’s American overseers have announced that Radio Svoboda, which reaches an estimated 150,000 listeners daily, will turn exclusively to the Internet where it hopes to reach a younger generation of Russians. The new broadcasting law, spearheaded by Putin, orders companies that are more than 48 percent foreign-owned to leave the Russian airwaves. It comes on the heels of the ouster of the U.S. Agency for International Development (USAID), a nonprofit aid group recently banned from operating in Russia. Soon after the radio measure was approved, RL axed the majority of its veteran reporters, radio hosts, and editors—a move viewed as suspicious to many on the inside. A handful of additional RL staffers quit in protest following the firings. Experts fear that the disappearance of RL’s independent voice from the airwaves will allow Putin’s regime to further tighten its grip on the flow of information in Russia. "I think they have already destroyed the radio so much loved and followed by those Russian listeners who stand for freedom and democracy," Mario Corti, a former director of Radio Liberty’s Russian Service, told the Free Beacon. "They are lying to the media by playing down the scale of the firings." Corti and other insiders who spoke to the Free Beacon both on and off the record believe that RFE’s Washington-based leadership used the new law as an excuse to abandon the radio businesses, which had become costly and difficult for D.C. bureaucrats to control. However, the Broadcasting Board of Governors (BBG), which oversees RFE-RL, disputes these accusations. It maintains that the new law forces leaders to take painful yet necessary steps that will benefit the organization in the long run. "What I think is that the new law on the media was just an excuse for the BBG and [its president and CEO Steven] Korn to do what they had already previously planned to do—get away [from] radio altogether," Corti said. "The bottom line is that some BBG members and RLE/RL bureaucrats are not and have not been comfortable with radio as a medium at all." The BBG and RFE’s leadership are acting in a shortsighted manner, others maintain. A pro-democracy presence is needed more than ever in an increasingly authoritarian Russia, these experts say. "They’re making budget cuts and they don’t know much about the region," said one former RFE executive who requested anonymity. "They’re just political appointees." RL’s overseers in D.C. "are not Russia specialists or journalists," griped another source familiar with the station’s operations. "It’s really a blow against the American radio presence and American media presence at a time when Putin is already doing all he can to undermine Western influence." A "perfect storm" is brewing in Russia as Putin’s regime cracks down on Western freedoms, the RFE source warned. "This is capitulating to Putin, and Putin is very sophisticated and knows how to work the Americans," the former executive said. "The reaction [by the Obama administration] has been too limp." "It doesn’t surprise me in the least that there’s been little pushback from the administration because they don’t want to piss off the Russians," the source said, pointing to President Barack Obama’s policy of a "reset" with Russia. BBG officials argue that their critics are overreacting. "Some of our critics claim quite incorrectly that we are withdrawing or retrenching in Russia," Korn told BBG’s board during its monthly meeting last week. "Nothing could be further from the truth. We are adapting to change conditions with a new strategy and focus." The U.S. government is "not decreasing the amount of money" spent on funding RL in Russia, despite speculation, Korn said. RL will pivot to the Internet and other new media platforms in the coming months in an effort to reach a younger generation of Russian dissidents. Masha Gessen, a veteran Russian journalist, was recently selected to head RL’s Russian service. Gessen has drawn both praise and criticism for her reportage, which has often been critical of Putin’s regime. Questions remain, however, as to why so many veteran RL reporters were fired suddenly. "I don’t know the reason. I don’t know why it has happened," said Russian journalist Natalya Rostova, who has been covering the controversy as a senior correspondent for the website Slon. "Everybody is unhappy with it, but we don’t get any answers of why." The former RL reporters lent the station much-needed credibility, a source said. "You’re losing contacts, a knowledge base," explained the former RFE executive. "You’re losing that whole network of stuff and the news operation was good. You’re losing that." Others doubt that the Internet is the best place for RL’s content. "I remember the Soviet Union as a child, and how my parents huddled over our radio listening to Radio Liberty, hanging onto the words," recalled Anna Borshchevskaya, assistant director of the Atlantic Council’s Patriciu Eurasia Center. "It was a symbol of hope, a connection to the West, a source of information they could trust." RL had a proud tradition of "defending democracy in Russia," explained a source who has knowledge of the station’s operations. "By decapitating the station, they’re breaking the link with the past." Officials on both sides of the ocean have failed to offer a comprehensive plan for the station’s future, experts maintain. "We don’t see what it will be instead," said Rostova, who is also a fellow at the Woodrow Wilson International Center for Scholars. "It has no base—all it has is the name ‘Radio Liberty,’ but it won’t be Radio Liberty at all. The audience will be destroyed." The BBG, however, remains confident that it has made the right moves. "In the world in which we live today, AM radio is a bygone era," Korn said during last week’s board meeting. "If we are to succeed in reaching those young, urban educated Russians who are at the forefront of change in their country and who will lead Russia in the future, it will not be on a weak AM signal that can only be heard in parts of Moscow." Korn went on to defend the firings. "Sadly the cessation of our AM signal and switch to a digital service requires new ways of working with fewer people and some people with different skill sets," he said. Critics of the plan suggest the U.S. should find a Russian business partner who could take over majority ownership of the station, thereby skirting the new broadcasting law. Korn and other American officials have maintained that this is not feasible, however. For many like Borshchevskaya, the end of Radio Svoboda signals the defeat of American values. "I remember how during on of the putsches [or attempted coups], when emotions ran high, a song kept repeating on the radio with a refrain saying that there’s one word that ‘turns a mob into a people: svoboda,’ the Russian word for ‘freedom’ or ‘liberty’," she said. This entry was posted in National Security and tagged Barack Obama, Media, Obama Administration, Russia, Vladimir Putin. Bookmark the permalink.